One stereotype that Japanese have about Americans is that all Americans eat hamburgers and that American hamburgers are bigger than Japanese and all other hamburgers around the world. 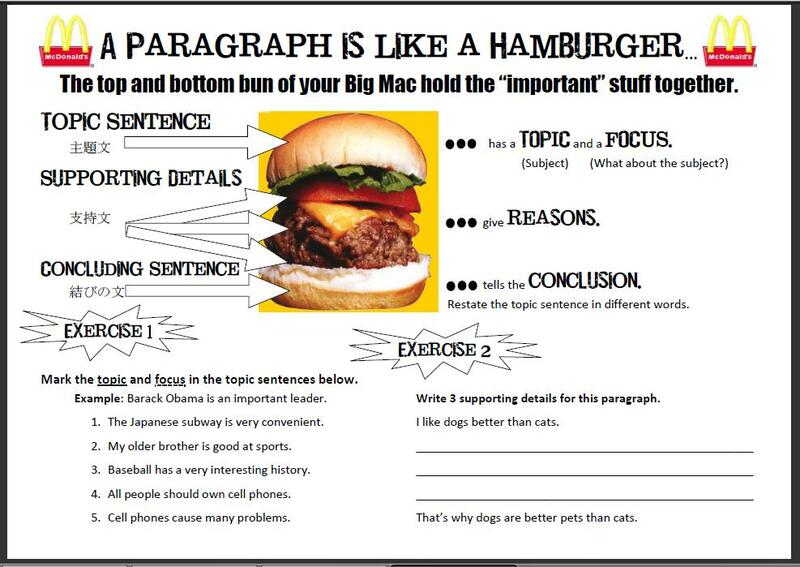 Often my students will write in an essay that they want to go to America to try an American hamburger. I think they will be sorely disappointed that most of the time if we're eating a burger, it's usually from McDonald's, not the kind they imagine, as McD's is the same in Japan basically. 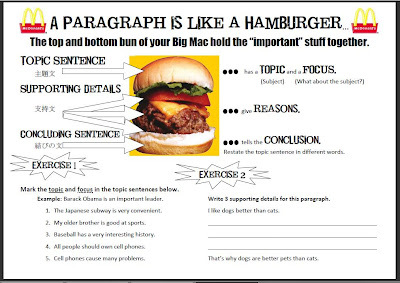 Anyway, building on this stereotype, I was researching "How to write a paragraph" the other day and found this random PowerPoint comparing a hamburger (actually a Big Mac, which is inaccurate as a Big Mac has a bun in the middle...) to a paragraph, the buns being the topic and concluding sentence. So I decided to run with this and make a worksheet based on a big, fat, juicy cheeseburger. Thought you might enjoy it. This worksheet is actually for second year students (grade 11), who I don't usually teach. I grade their essays, but don't get to actually teach them. Finally (! ), my teachers asked me to help, teaching the kids how to write a proper essay. 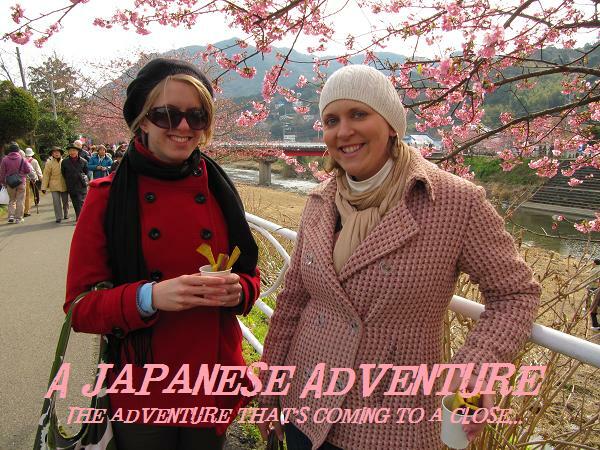 I've been hoping for more classes my whole time in Japan, so it's exciting...though since I'm leaving in like a month and a half, it seems a bit late in coming. Either way, I enjoy the students and it will be nice to see them one more time before I leave. They were the only class that I taught from start to finish here in Japan, so they are the nearest and dearest to my heart. In other school news, school festival is next week. I'm super excited about it this year, because I remember how much fun it was last year!! It does mean however that I have to work 8 days in a row, possibly 10 days if it's rainy on sports day/sports day make up day. I'm crossing my fingers for good weather. 8 days is enough, I don't need to tack on 2 more days to that! Then I get one holiday, and will go back to school til Friday. Until next time...thanks for reading folks. Sorry I've been MIA on the phone calls. I've been busy almost every night, so much so that I'm making myself sick. Need to give myself some R&R this weekend to recover! Sorry I never responded to your email ... I have a worksheet almost exactly like this. I have my ninensei do homework every week, and I mark them way down if their conclusion and topic sentence are not the same. It works pretty well. It's okay -- Liz helped me out with one sheet as well that shows the structure of an essay, so I think I'll start with this one and end on hers before assigning the next essay. It's frankly a little late in the game for me to be teaching them how to write an essay...but hopefully will ease the pain of reading terrible essays in the future for my successor!